Piece of furniture or structure situated behind or above the altar, made with various techniques and materials. In medieval times the altarpiece evolved from its initial oblong format to being vertical, tending to increase its dimensions and being organized hierarchically according to more or less stable parts. The main body is structured around the central panel, in which the main figure or figures are represented, and next to these there are a series of panels with narrative scenes, organized vertically and horizontally, called side panels or wings. Sometimes the side panels can be separated by narrower panels, the mullions, also divided into compartments, the transoms, often decorated with images, coats of arms, etc. The central panel is often finished with a compartment that protrudes at the top, the attic, where the Calvary is usually represented. The perimeter of the main body of the altarpiece is surrounded by an inclined projecting moulding that projects it, called the dust cover or dust sheet. Under the main body of the altarpiece there is generally an oblong piece with various compartments that is called the predella or baize cover, which on occasions is divided in two parts which flank the central shrine. In certain cases, on the ends of the predella there are doors that provide access to the vestry located behind the altarpiece. 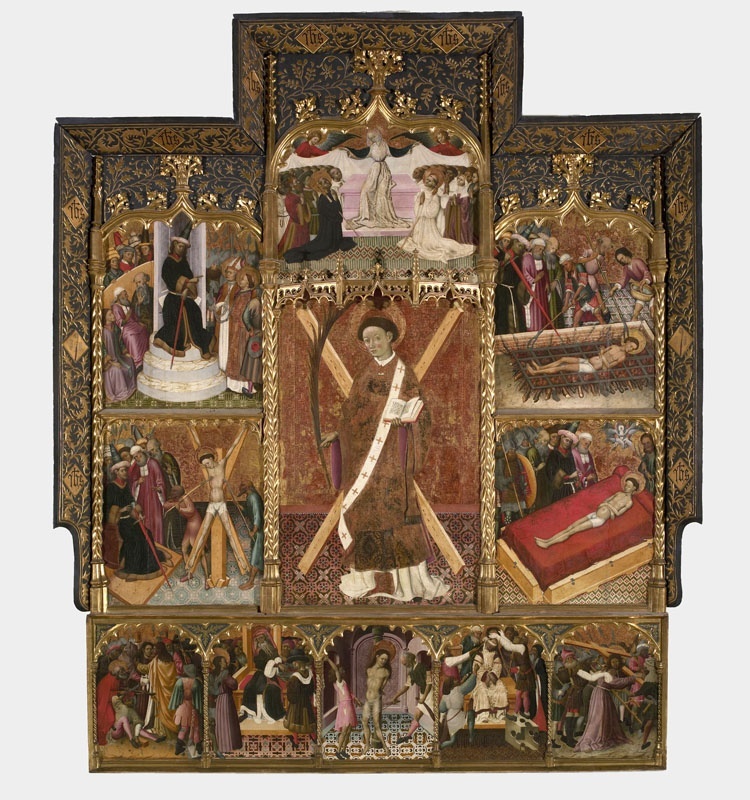 In Catalonia, towards the end of the middle ages the altarpieces reached really colossal dimensions and a notable ornamental development, which is especially evident, among others in the battlements formed by canopies and pinnacles.